Julian Opie (b. 1958, London, UK) lives and works in London. Graduated from Goldsmiths School of Art, London (1982). 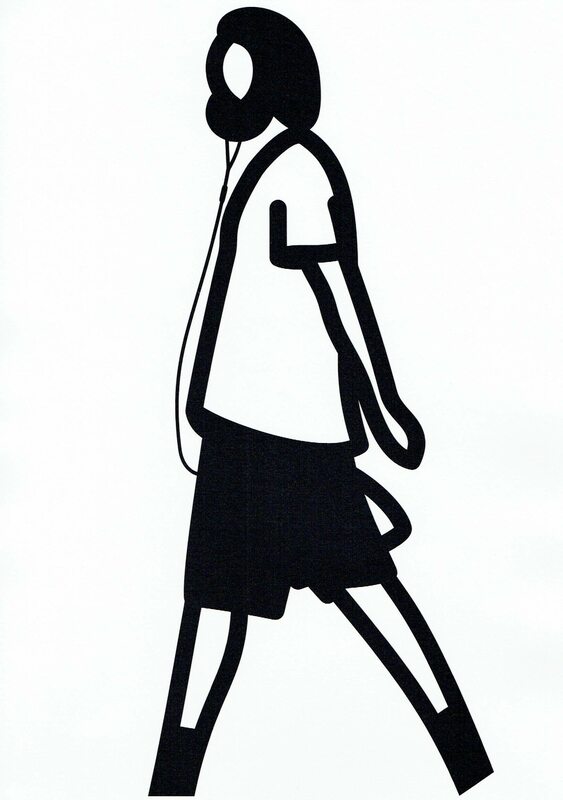 Opie is known for his minimal portraits and animated walking figures. His work combines the use of new technology with stylised black line drawings. Select solo exhibitions include Art Geneve, Geneva (2016); Gerhardsen Gerner, Berlin (2016); Krobath, Vienna (2016); ARCO, Madrid (2015); Mario Sequeira, Braga (2015); Kunsthalle Helsinki, Helsinki (2015); Alan Cristea Gallery, London (2015); and Gerhardsen Gerner, Oslo (2015). Select group exhibitions include Line, Lisson Gallery, London (2016); MODEL, Galerie Rudolfinium, Prague (2015); Self: Image and Identity, Turner Contemporary, Margate (2015); Face: Between figures, portraits and masks, Neus Museum, Nuremberg (2015); and Making it: Sculpture in Britain 1977 – 1986, Yorkshire Sculpture Park, Yorkshire (2015).